What does the term 'kiting' mean when used for games? I've seen the term thrown around here and there in reference to a few different games. Are there specific types of games that it applies to? Kiting refers to keeping an enemy chasing you while also keeping it at a range where it cannot attack you. This tactic is often used to more safely attack the enemy using a long-range attack or to distract the enemy while others attack it. The effect looks like you have the enemy on the end of a string, kind of like a 'kite', because you are both moving in the same direction and he's never catching up to you. It is a generic term that applies to any game with mechanics that allow it. "Forcing an enemy to follow you around." In MMOs tanks kite mobs while getting the crap beat out of them. So the "at a range where it cannot attack you" doesn't apply. Also many mechanics like avoidance, spell reflection, self healing, etc... can be in effect to allow you to survive while kiting. In EQ1, "fear kiting" was widely used by necromancers. Necros would fear the mob, and it would run in the opposite direction, at which point you'd cast spells on it. When fear broke, you would simply recast it. While the mob was feared, the player would chase the mob, instead of the other way around. Another form of kiting is done with a group, where one high aggro person would have the mob chase him around, while others would beat on the mob. Since the person at range was highest on the aggro list, the mob would ignore the rest of the group, even though the rest of the group was within striking range. Sometimes a pet or charmed pet is used instead of a group. This is sometimes called "aggro kiting." Another form of kiting is "charm kiting," which is where you charm a mob to make him your pet, send him at another, more powerful target, and when the more powerful mob kills your pet, you root/snare/stun/mez it, and charm another pet. The process is repeated until the powerful target is dead, which can take anywhere in between 3-30 minutes. This is different from the kiting mentioned in the previous paragraph because, here, your charmed pet is actually taking damage, but if it is easily replaced, that's not a problem. Yet another version of charm kiting is done as part of an experience grind. Once again, since charmed pets are often weakened while charmed, they will lose to an equally powered mob 99.999% of the time. The idea is to break the charm right before your pet dies, at which point you finish it off. However, it's faster to send your pet at multiple mobs, in an attempt to have its health drop more quickly. This is extremely dangerous, as it requires you to run around to avoid the 3+ mobs that you have aggro'd. Having 4-5 mobs on you is typical, but I've done it with 10+ mobs. Since someone employing this strategy is often being followed by a "swarm" of mobs, this is called "swarm kiting." There's a few more, but you should have the idea by now. Are there specific types of games that it applies to? Since no one else seems to have touched on this, kiting can apply to a variety of game genres, depending on the game, but one that it applies strongly to is the dual-stick shooter genre, where players often end up circling the stage continuously, while enemies follow after them. 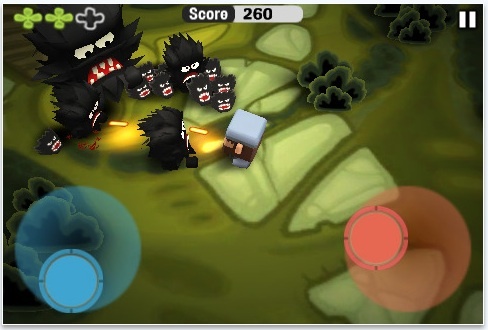 Minigore is a good example of a dual-stick shooter. The term is also often used in MMO (Massively Multiplayer Online) games. In this context, it often refers to one player 'baiting' any number of enemies while other players attack them. What does “kite” mean in LoL? How do I defeat Fuad the Cannibal? How do I run backwards whilst still attacking? What is damage spread as it relates to Team Fortress 2? What does “PvP” mean in multiplayer servers?